The Noise Masking V2 is a dual channel DSP noise masking controller in a 19” rack mounting chassis. 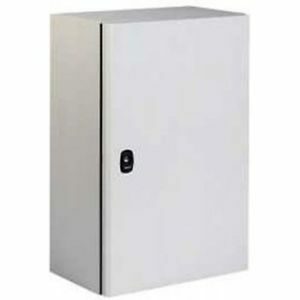 It contains a multi-function digital processor featuring analog noise input and PA input mixing, capable of transforming any Public Address or Voice Alarm system into a combined PA/Noise Masking system. Provided with a 32 bit, 147 MHz clock speed DSP as well as 24 bit A/D and D/A converters, the unit is controlled by software to fine tune the noise curve required for the target area. There are four separate noise channels that each have independently adjustable cross-overs and 32-band equalization, all adjustable via the PC control software. There are also two analog inputs that can be used for PA mixing from the host PA or VA system. PA Input 1 mixes audio with noise channels 1 and 2, while PA Input 2 mixes audio with noise channels 3 and 4. The Noise Masking V2 unit also allows for attenuation of the noise signal during PA announcements. When an announcement is detected the noise dips to a low level so that it doesn’t impede the intelligibility of the PA audio. Once the announcement has finished, the noise level slowly recovers to its pre-set level. This slow restoration of noise keeps the presence of noise discrete and in-discernible to the occupants of the target area. The unit consists 3 main sections: Transformer isolation and mixing Noise generator and VCA DSP Audio processor The audio transformer isolation module consists of line level transformers that provide isolation and also balances the input and output feeds. The noise generator board produces a low level random analog signal. The signal is a broadband noise signal limited only to the 20Hz to 20kHz audible range. 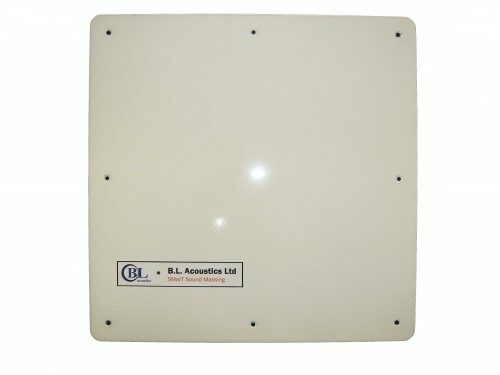 This board also takes the PA input from the isolating transformers which is rectified and applied to a voltage controlled amplifier which in turn adjusts the output of the noise generator negatively – providing the attenuated noise adjustment during PA announcements. Adjustments are available on the board that allows adjustments to the sensitivity and the attack time of the VCA, as well as a general volume level for the noise outputs. The DSP audio processor features a 32 bit Cirrus Logic (Clock speed: 147 MHz) Digital Signal Processing chip and A/D / D/A converters working in PCM at 48 kHz with 24 bit resolution. The processor speed allows the installer to hear and verify in real time the changes applied during the equaliser adjustments. The board has volume adjustments for each of the two noise inputs. The software can be used on-site with a laptop connected via the front-panel USB connector to make the necessary adjustments to the noise curve. Equalisation is via a 31-band graphic equalizer (1/3 Oct.; ±12 dB) for each output channel. The set-up and commissioning of this equipment must be carried out by a suitably qualified electro-acoustic engineer with appropriate knowledge of the associated equipment and acoustic properties of the target areas. It is recommended that a Type I SPL and Audio Analyser be used when commissioning. Sound Masking systems are typically installed above false ceilings producing the sound within the ceiling voids, but there is not always space above the ceiling for the equipment. This is where the SMarT Sound Masking system can fill the gap. The majority of modern offices are built using stud walls which have a cavity between them. The SMarT Transducer can be installed into a stud wall and utilise this cavity to produce the same levels of privacy. Injecting a shaped sound directly into the wall cavity, the system also excites the wall itself providing a two fold approach. Not only would you be unable to understand speech from the room next door but even if you were to place your ear or listening device to the wall the SMarT Transducer would destroy the intelligibility. The SMarT can be used in conjunction with other systems to produce extremely high levels of privacy where security and confidentiality is of premium concern. The units are 100mm deep and are 250mm x 250mm square inside the wall cavity. The external facia can be standard white or coloured to suite the room décor. Systems must only be setup by qualified Acoustic Engineers with the appropriate Type1 calibrated SPL third octave measuring equipment. The Wall-mount NM Controller is for use with the SMarT in-wall sound masking transducers. The transducers are self-amplified and powered from the wall-mount controller. The controller contains a noise generator and multi-channel DSP equaliser. The noise generator board produces a low level random analog signal. The signal is a broadband noise signal limited only to the 20Hz to 20kHz audible range. The DSP audio processor features a 32 bit Cirrus Logic (Clock speed: 147 MHz) Digital Signal Processing chip and A/D / D/A converters working in PCM at 48 kHz with 24 bit resolution. The processor speed allows the installer to hear and verify in real time the changes applied during the equaliser adjustments. The board has volume adjustments for each of the two noise inputs. The software can be used on-site with a laptop connected via the front-panel USB connector to make the necessary adjustments to the noise curve. Equalisation is via a 31-band graphic equalizer (1/3 Oct.; ±12 dB) for each output channel. The set-up and commissioning of this equipment must be carried out by a suitably qualified electro-acoustic engineer with appropriate knowledge of the associated equipment and acoustic properties of the target areas. It is recommended that a Type I SPL and Audio Analyser be used when commissioning. 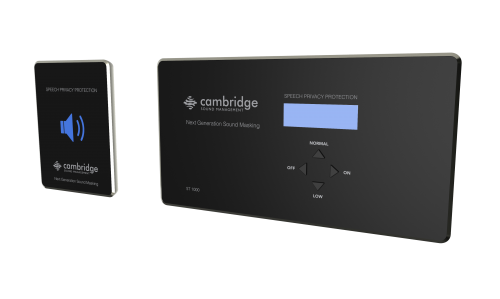 The Qt Conference Room Edition from Cambridge Sound Managementis a cost-effective solution specifically designed to protect the speechprivacy of conversations in conference and board rooms.All-in-one solution for conference room privacyThe Qt Conference Room Edition consists of a control module, two lightedprivacy signs, and a series of direct-field sound masking emitters. 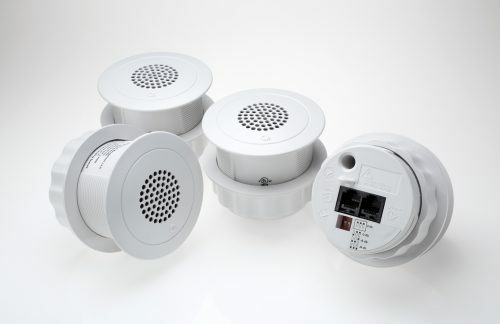 When a roomoccupant turns on the control module inside of the conference room, it powersthe sound masking emitters placed in the ceiling just outside of the conferenceroom. The emitters add a low level of background sound making human speechless intelligible. Lighted privacy signs inside and outside of the conference roomindicate the system is running, and let conference room occupants know theirconversations are being protected.Easy to retrofit into existing conference roomsOften overlooked in conference room design and construction is the potentialfor private conversations to travel easily under, over, or even through wallsand doors. In fact, according to a recent study fifty-three percent of supportstaff workers have overheard confidential conversations at work.1 Installthe Qt Conference Room Edition today to ensure your private meetingsremain private. The Qt® 100 is ideal for single zone spaces of up to 12,000 square feet (1,115 m2). 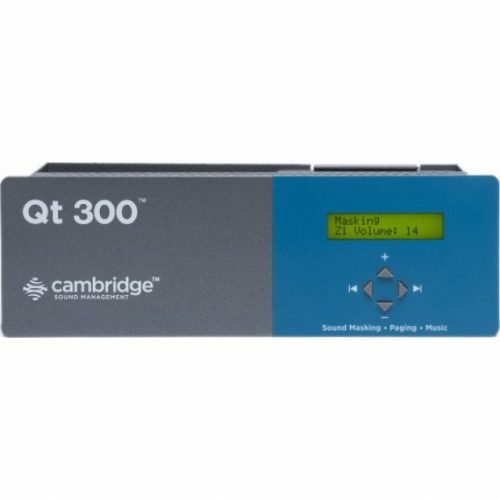 The Qt 100 is easily controlled from the module’s front panel, making volume adjustments quick and easy. The Qt® 300 is ideal for medium multi-zone spaces of up to 36,000 square feet (3,345 m2). This system is capable of covering up to 3 diverse areas in buildings needing improved speech privacy.This robust and feature-rich system is easy to control and maintain. Users can adjust system settings via the easy-interface front panel, and can also set up error reporting and establish time dependent masking levels via their PC, Mac or tablet device using the intuitive Qt® Monitoring and Control Software. 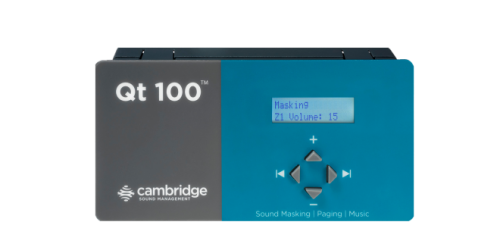 Additionally, the Qt 300 is an integrated solution offering sound masking along with paging and music via the two auxiliary audio inputs. The Qt® 600 is ideal for medium to large multi-zone spaces of up to 72,000 square feet (6,689 m2). This system is capable of covering up to 6 diverse areas in buildings needing improved speech privacy.This robust and feature-rich system is easy to control and maintain. Users can adjust system settings via the easy-interface front panel, and can also set up error reporting and establish time dependent masking levels via their PC, Mac or tablet device using the intuitive Qt® Monitoring and Control Software. Additionally, the Qt 600 is an integrated solution offering sound masking along with paging and music via the two auxiliary audio inputs. Qt® Adjustable Emitters are the backbone of the Qt Quiet Technology and Voice Arrest Sound Masking System. Qt emitters are wide dispersion direct field speakers with 1.5” (3.8 cm) drivers and are smaller than a coffee mug. Qt emitters come in two varieties: standard and adjustable. These emitters deliver four uncorrelated audio channels, which provide uniform, unobtrusive sound masking. This feature, along with plug and play installation and easy configuration capability, make Qt™ systems the most intelligently engineered and most effective sound masking systems on the market today.Qt® Adjustable Emitters offer users greater flexibility in laying out their Qt system. Adjustable emitters allow users to reduce the volume level of an individual emitter by up to 9 dB in 3 dB decrements. The adjustable emitter is appropriate for individual spot adjustments, or creating micro zones down to 100 square feet (9.3 m2) of space.Comes standard with slip ring for acoustical tile mounting. Available in White or Black.